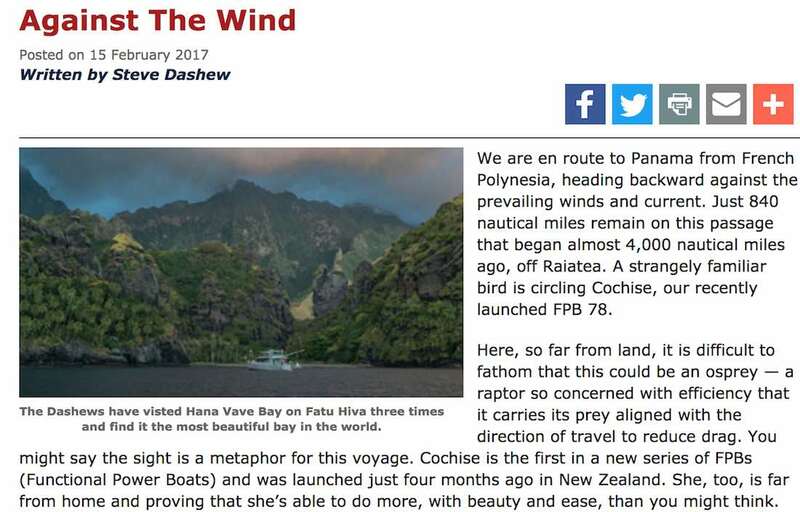 The first article is written by Steve, diving into both early sea trials and the 4,700 nautical mile passage Cochise recently accomplished from Hanavave Bay in the Marquesas to Panama. Following this is a detailed piece by Soundings writer Dennis Caprio, investigating the attributes of the entire FPB line of yachts. Read all about it Here. This entry was posted on Thursday, February 16th, 2017 at 1:23 pm and is filed under Dashew Logs, FPB 64, FPB 70, FPB 78, FPB 83, The Logs, Wicked FPB 97. Both comments and pings are currently closed. Great article! At least until you get to the 2nd to last paragraph summarizing the trip to Panama. Claiming 8.67 gallons/Nautical mile, I would hope it is just a misplaced decimal point. That is indeed a mistake! The actual fuel burn is .867 gallons/nm, just under 1 gallon. We’ve asked Soundings to change the number online..
Hi Gene, it’s a typo — the number is supposed to be .867 gallons/nm. We’ve asked them to correct it online. Hi Steve – great article! I particularly like that you decided to alter course to visit Fatu Hiva – I hope the waho and mahi-mahi we’re as perfect as their timing! Since I started following the FPB’s, many questions I’ve had were answered just by reading a little further. That said, I haven’t come across a discussion regarding stabilizer choice (fin vs. gyro) and I’m interested in how you reached that decision. I suspect the decision was made around reliability but, in my ignorance, wonder if it’s also related to how well the keelless FPB’s track in challenging seas and when surfing. We are once again looking at the gyros. More details in due course. … more blessings/advantages from the brilliance of the solar-panels/battery-bank engineering — now, a shift from hydraulic to electrical stabilization becomes possible/available — without having to run an engine or a generator; especially, when at-anchor — am i tracking with your thinking? … if you haven’t already, you can tap-into a builder’s perspective if you know or ask Bob+Mary Johnstone — the Seakeeper gyros (electrically-driven) are standard-installs in their MJM 50 (an cat-A offshore performance boat) (http://mjmyachts.com — scroll to the bottom for the page-link to the Seakeeper-vid, if you haven’t already seen theirs). ps- your wisdom is spreading — https://www.morganscloud.com/2015/01/10/a-real-sailors-motorboat-launched/; http://www.artnautica.com/designs/long-range-cruiser-58; and https://www.youtube.com/watch?v=q0y6NnhVb-c.